7 To be honest, we all have faced examination traumas and know how difficult it is to finish an entire year’s syllabus in just a week or maybe even a day. It is when examinations are knocking on our doors that we panic and search for ways to complete everything as soon as possible. We think of studying for 12 to 16 hours straight. You may have heard many say that long hours study methods are ineffective but we all swear by last moment studies. 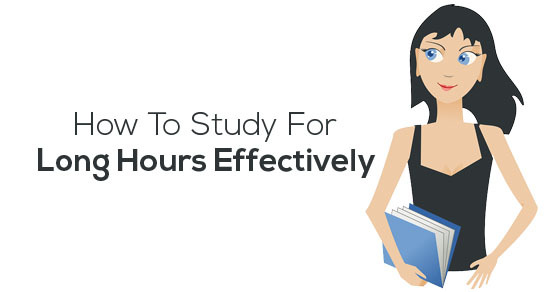 Let us look at some pointers that explain us tips to study for long hours effectively. your study schedule smartly and make sure that it does not exhaust you. Weight training, cardio/aerobics, meditation, breathing exercises or yoga help you to boost your mental power and concentration. The following mentioned are few effective study techniques that provide all the students with the best ways to study effectively before exams without being tired. Start by convincing yourself that you can pull it off. You can do what you believe you are capable of doing. You need physical as well as mental strength to accomplish this. You need to prepare yourself mentally as early as the night before you are actually planning to study for long hours. This will build up your determination and you will think twice before giving up. Ever wondered why your mothers pestered you to sleep in the afternoons? Yes, you got it. While you sleep, your body, as well as your brain, continuously generates new cells. If your body is well rested, you can effectively study smart way, as long as you want to. Therefore sleeping well the night before is crucial to your mental as well as physical stamina needed to study for long periods of time. A large amount of energy in our body is wasted during digestion. Therefore in order to avoid feeling tired or groggy while studying, always eat foods which are easily digested. Consume carbohydrates and proteins. Avoid fried food, fats and sugars as much as possible. Don’t sip on cola or junk food from outside and drink plenty of water and fruit juices. Exercise right before you sit to study or in between when you are taking a break. Exercise will greatly boost up your energy levels and you will feel more alert and agile. Please avoid doing strenuous strength training like lifting heavy weights or high-intensity cardio. Yoga, Pilates or a few minutes on the treadmill or brisk walk or skipping or half an hour of swimming is recommended. This is one of the best ways to study. We all have those specific hours during which we are most energetic, most efficient and creative. Those are your peak hours. Try identifying them to get the maximum results out of your time. It is relatively easy for some to study all night whereas some may find it easy to study all day but may find it difficult to stay up past 12 am. All this depends on the individual’s study habits. Therefore identifying your peak hours is important study tip. You might think sipping on a lot of coffee will help you stay awake. Sadly this concept is wrong. Yes it does boost up your energy level but consuming too much will make you feel more drowsy than energetic. The sugar content here is the devil. If at all you want to consume coffee, make sure it is sugarless and the total intake should not be more than 2 to 3 mugs. Long hours are full of distractions. It is very easy for us to lose focus or get bored. Perform a simple exercise of concentration every day to improve it. Light a candle in a dimly lit room. Sit up straight with your legs folded in the fashion of a yoga asana and stare at the candle flame as long as possible thinking about nothing. It is going to be very difficult initially but gradually your time and focus will increase and so will your level of concentration. You can never concentrate or even try increasing your levels of concentration if you keep objects of distractions all around you. Put away your laptop if you are not using it for studies. Switch off your mobile phone or silence it. You can obviously check for important calls or messages every time you take a break but not always. The motive is to keep away the constant beeping of a mobile or the urge to post on or check your social media profiles. The best way to keep your focus and go on for long hours is to take a 10 to 15 minutes break every 1 to 2 hours of study and a 30-minute break every 6 to 8 hours. The average span of attention for human beings is approximately an hour. Realize why we have 40 to 50 minutes periods at school? It is probably to ensure that what we learn stays with us longer. Studying for long hours will be rendered useless if you do not manage to complete your portions and keep dragging with the same chapter. You can avoid this by sectioning it up and being a bit more organized. Read it first, then learn it, then write it down. Identify your mistakes. We tend to remember our mistakes so always make a list of your mistakes and work on those more. Adding variations is very helpful especially when you are trying to study straight for several hours. It is one of the ways to avoid boredom. For example, if you are preparing for different subjects say History, Geography and English, try learning history for 1 hour and then shift to geography or English. Similarly, mix 2 chapters for 1 subject. This will break the monotony. Writing is better if you are studying for long hours. Thinking for the answer will distract you making you feel you haven’t learnt properly when you actually have. Firstly while writing you can in no way fall asleep. You tend to be more alert. Secondly, when you write, try to remember it then mentally recite as you write. Therefore written work is more accurate as it combines recalling, mental recitation and lastly writing. This is by far the most important rule for effective studying for long hours. Boredom is the biggest enemy of long hour studies and can hinder all your efforts. You can’t control being bored as it is involuntary but you can follow certain tricks to involve creativity into your learning and eliminate boredom. Here we will discuss different creative ways of learning. These are the few clever ways. The idea here is to create visual or abstract images of the theory that you are learning. We remember things we see and hear better. A simple example is if you want to remember Newton’s second law of motion which is force = mass*acceleration just visualize a fat man running fast and pushing a boulder. The man is mass, the speed in which he runs is acceleration and the movement of the boulder is the amount of force. Rote memorization is the method in which you continuously repeat information and cram it up inside your brain. This results in temporary memory and often things learnt by rote are forgotten after a day. Avoid using this technique for everything. Imply it only for facts and things which are too difficult to understand. For example computer programs, dates and events. Be like a curious baby who constantly asks “why?” and “what?” to anything and everything. This has two reasons. Firstly, if you keep asking why and what, your study material forms an interesting logical pattern and the portion starts to seem more obvious. Secondly, we fail to differentiate between important and unimportant. By asking “why?” you are questioning the importance of the matter. It will help you to strike out the unimportant portions. You can easily make complex things simple by drawing out diagrams. A simple example is if you need to learn all the parts of a human body or anything on a more complex level, just draw out the parts or look at diagrams. You remember it better. This is just an advanced form of visualization. Works best for Geography, Biology, Chemistry, Physics etc. Teaching someone or even yourself is an effective way of learning. If you don’t find someone to teach to, pretend to be a student yourself and try explaining things out loud. Try teaching the information as simply as possible so that even children understand it. You will find yourself understanding it better than when you had read it. This is called simplification. If you find your favourite spot for learning, half the job is done. It will help you stay focused, relaxed and not get bored for very long hours. For some, it is the desk, for some, it is the sofa and for some it is the bed. It can be anywhere you feel the most relaxed. A good familiar and relaxed spot is important for studying for long hours. If you have enough time left or even between chapters conduct a small test. You don’t need to write down everything. Jot down the information in points from which you can elaborate in your mind later. This way you will be confident about your progress which in turn will facilitate more learning. The job of listing important information for quick revision later will also be done. You can socialize, meditate, exercise, eat, party; whatever you need to do to relax just. Some get nervous when they are relaxing before an exam. Those people can just sleep. Different individuals get relaxation through different things. Find out your relaxation pill and indulge in it to keep yourself tension free the day before an exam. Distractions are common, especially when students are studying(it used to happen with me too). In today’s internet-friendly world where Facebook, Whatsapp, Mobile, etc have become an integral part of our lives the chances of getting distracted easily are even more. To overcome all such distraction while studying you can follow these tips. Switch off your Internet access. Get yourself 8 hours of sleep every night. Take a deep breath just when you’re getting distracted. Make use of Asana.com to prioritize your tasks. No usage of the Internet. Don’t even think about nonstop studying for more than an hour at once. After a while, you will feel as if nothing is going inside your head. Chances are you won’t retain much of the matter you learnt, in fact you might experience a brain block causing you to forget everything at the day of the examinations. Avoid it as much as possible. Please take note that a break does not mean you go and browse the internet, start chatting with your friends or the television. You won’t realize when the break is over. Set an alarm. You can walk around in your house, eat some snacks, check your phone but avoid engaging in useless conversations and relax or simply stare out of the window. Use visualization wherever possible but don’t try too hard as everything can’t be visualized. You can’t visualize complex mathematical or scientific formulas or dates and events of history but can easily visualize biology literature and the like. Understand that there are certain things which we can retain just by reading and understanding. Learning is not needed for them. Take note that following only one of these rules or any one method of learning will not give you the desired results. It will create monotony which we need to avoid if we want to study for longer hours. Therefore you need to think practically and logically and employ all these methods into your learning. Be creative always. So now you know whatever you should know about studying for long hours. Study for long hours obviously means that you don’t have much time left in your hands to prepare for the examinations. No matter how much you study, if you don’t relax you will be traumatized. Therefore relax, always think practically and avoid daydreaming or procrastinating. Time is precious. Make good use of it.